The primary race between two Democratic candidates for governor in Georgia exposes the larger questions facing the party. There are two Staceys angling to become Georgia’s first woman governor. The race for the Democratic nomination will culminate on Tuesday, when Georgians head to the polls for the state primary. But in the meantime, it has been an illuminating vignette, exposing the larger questions facing the Democrats ahead of the midterms—distinct from the tensions between the Bernie and Hillary wings of the party, and different, even, from the question of who can more fairly identify as progressive. Should Democrats focus more on capturing white working-class voters who feel let down by Trump? Or should they mobilize black voters and rally the base? A local Democratic strategist summed up the state of things this way: “The Democratic Party …” He took a long pause before letting out a dispirited sigh. “If you ask people what the Democratic Party stands for, they can’t tell you,” he said. “As soon as you get beyond anti-Trump, nobody seems to know.” The choice in Georgia is between two different playbooks: an ambitious-but-risky plan of action, versus a careful, more traditional one. More broadly, the Georgia race illustrates the challenges facing the Democrats not just in November, but also in 2020. This primary could help define the party and give it an identity it desperately needs. Georgia hasn’t had a Democratic governor since 2003, and it’s never had a female or African American one. In the 2016 election, Trump won the Peach State by five points, a smaller margin than Mitt Romney’s in 2012, but still a relatively comfortable one. It’ll be difficult for a Democrat to win here, but in the age of Trump, when the left is more motivated than ever before—and neighboring Alabama has a Democratic senator for the first time in a quarter century—the party thinks it has a real shot at replacing retiring Republican Governor Nathan Deal with one of their own. But which candidate, Abrams or Evans, is best positioned to beat one of the five white, male Republican candidates in a statewide race? Abrams (who also moonlights as a romance novelist) currently has a significant lead in the polls, although roughly one-third of voters are still undecided. “Our goal,” a spokesperson for the campaign told me, “is to reach out to a multiracial, multiethnic coalition of urban, suburban and rural voters.” It’s similar to the coalition of voters former President Obama used to win in 2008—but not quite. “It’s people of color with enough whites to be able to win, but it’s decidedly more progressive than what Obama put together,” said Andra Gillespie, an associate politics professor at Emory University. “[Obama] tried to de-emphasize race. Abrams isn’t trying to deemphasize race or her gender at all.” In fact, she’s stressing it. “People of color will be the center of [this] coalition because they are the majority of the Democratic party,” Abrams told MSNBC’s Joy Reid after launching her campaign in 2017. Republicans think Evans is the candidate who could give them a real run for their money. Vic Burgess, for example, is a self-identified libertarian who usually votes Republican, but this year, he’s leaning toward Evans. “She seems to have a heart for the average person,” Burgess said. The 44-year-old child advocate has lived in the small town of LaFayette his whole life. “The way she grew up I think is reflective of a way a whole lot of people in Georgia grew up,” he told me, noting that Ringgold is just a 30-minute drive from LaFayette. Since before the 2016 presidential election, Democrats have been wrestling with exactly how to appeal to the dejected members of the white working class, the concerned retirees living in the suburbs, the wayward souls riddled with cultural anxiety. Party leadership has tried a few things: They announced their 2018 campaign agenda, with a focus on the economy, in the mostly white town of Berryville, Virginia, where Trump won 57 percent of the vote in 2016. They’ve thrown money at candidates like Pennsylvania’s Conor Lamb, whose moderate posture and unwillingness to bash the president led him to victory in a district Trump won by 20 points. But what if Democrats didn’t focus so much on reclaiming Trump voters? What if they dedicated their resources, instead, to reaching the millions who didn’t vote—and reaching them early? This is the question Stacey Abrams is asking. 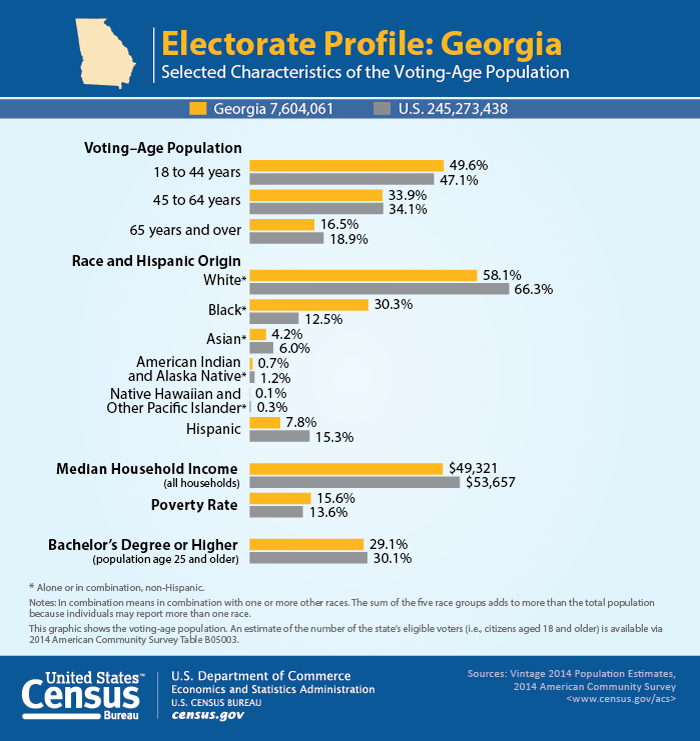 The voting-age population of Georgia, which includes roughly 7.6 million people, is 30 percent black. In the 2012 general election, African Americans made up nearly 30 percent of the vote, but that number declined in 2016, when black voters made up slightly less than 28 percent. For the past two midterm elections, there were roughly 1.1 million registered black voters in Georgia, and about 700,000 unregistered black voters, according to an analysis from the Center for American Progress. Abrams sells herself as the person who can address these gaps in registration and turnout. In fact, she’s been working on it since 2014, when she founded the New Georgia Project, a nonprofit focused on registering voters from the “New American Majority”—people of color, people aged 18 to 29, and unmarried women. These groups make up “62 percent of the voting age population in Georgia, but they are only 53 percent of registered voters,” the organization suggests. The project, partly funded by big-time Democratic donor George Soros, aims to register more than 700,000 currently unregistered Georgians. But it has come under fire for an alleged lack of transparency, and for failing to meet its registration goals ahead of the midterms. Georgia Secretary of State Brian Kemp (who is now running for governor on the Republican side) investigated the organization and concluded it had submitted dozens of fraudulent voter applications, although the number was less than 1 percent of total registration forms. “[Evans] is persuading folks to become Democratic, and our focus is more about reaching folks who do agree with us, and convincing them that voting actually matters,” the Abrams campaign spokesperson said. To do this, Abrams has pledged to work for a “fair and diverse economy”: tackling poverty and inequality through her proposed “Georgia Economic Mobility Plan.” She’s also advocating for criminal-justice reform, with goals like the “decriminalization of poverty” and improving community policing. Abrams’s supporters have seen the Evans attack ad, which stars a young African American woman, and the people I spoke with think it makes Evans, rather than Abrams, look bad. “Quite frankly, I get the impression that it’s pandering,” said Tameeka Hunter, a 44-year-old graduate student living in Atlanta. The Evans camp received similar criticism back in January, when it ran an Instagram ad showing the candidate praying alongside black worshippers at a Baptist church—and ending with her face superimposed over an image of Martin Luther King Jr.
“When has [Evans] ever been anywhere in the black community?” asked Atlanta resident T. Renee Crutcher. Crutcher, an ordained minister in her late 50s, then cited a recent report showing that Evans was a lead attorney for Bank of America after the housing crisis, and defended Countrywide Financial, the company that charged African American and Hispanic families higher fees for loans. The report accused Evans of “helping in the greatest theft of black wealth since Reconstruction.” A spokesperson for the Evans campaign acknowledged that Evans was assigned the case as a junior associate, but only worked on it for two months. It seems that the Democrats are acknowledging this. When Doug Jones became the first Democrat elected to the Senate in Alabama in 25 years in December, many on the left saw it as a reassurance that appealing to moderate conservatives and persuadable Trump voters was a winning strategy. But exit polls showed that Jones likely won because black voters showed up in historic numbers: 96 percent of black voters backed the Democrat, including 98 percent of black women. Georgia Lieutenant Governor Casey Cagle has emerged as the favorite to win the Republican primary, while Abrams has a 19-point lead over Evans, according to the most recent poll. Around 33 percent of Democrats are still undecided. If Abrams beats Evans in Tuesday’s primary, it’ll be a testament to her success in prodding the base to the polls, as well as her fundraising ability. But the real test will come in the general election. If Abrams becomes the Democratic nominee, can she successfully motivate a “multiracial, multiethnic coalition” to make her the first African American woman governor of Georgia? In a state with over 6 million voters—most of whom are white—will she have to significantly change her strategy?